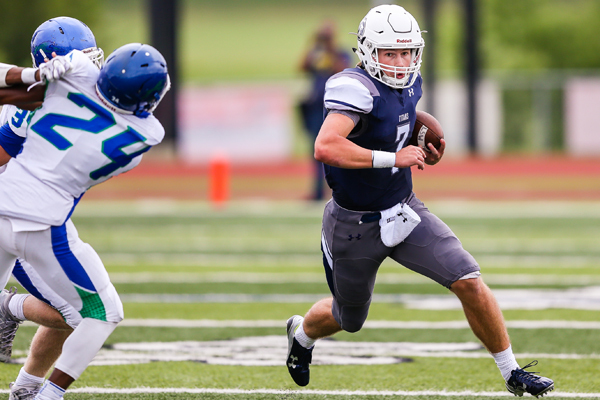 When Lee’s Summit West and Blue Springs South resumed the second half of their game on Saturday, the Titans knew gaining momentum would be crucial. And early on Saturday morning it looked like momentum would be hard to find. The two teams watched their drives stall out until midway through the third quarter. That’s when Lee’s Summit West, who led 21-14 when lightning postponed the game on Friday, struck. Quarterback Cole Taylor found fullback Kevin Knox just three yards beyond the line of scrimmage. From there Knox rumbled down the left sideline for at 76-yard touchdown. It would ultimately be the game-winning score as the Titans defeated the defending Class 6 champion Jaguars, 35-23. The momentum was something that Careswell and his staff were worried about heading into the game. Led by Taylor at quarterback though, the Titans dominated the game, which resumed just two plays into the third quarter. Taylor finished the game with 196 yards through the air and three passing touchdowns, including a pair to 6-foot-7 wide receiver Elijah Childs. Taylor also led the Titans on the ground with 69 rushing yards on nine attempts, highlighted by a 35-yard touchdown run. Taylor admitted having a large target like Childs as a safety valve is a nice luxury. “It’s really not fair. He’s a 6-foot-7 target and a lot of the defensive backs that are covering him are 5-(foot)-5,” Taylor said. While Childs has been a luxury for Taylor, Taylor has been the same for a team that has both a new coach and new offensive coordinator. The Jaguars meanwhile weren’t really out of the game until midway through the fourth, when they had a pass that would have drawn the game to within two scores intercepted in the end zone by Jaquae Jones. On Friday, the Jaguars got a pair of rushing touchdowns from Camden Sprouse and Jerome Hawkins. The road gets no easier for the Jaguars, who host Rockhurst. “We have to improve in all three phases this week,” first year head coach Jon Oyler said.